By virtue of its location close to the equator and within the Pacific, the El Nino – Southern Oscillation (ENSO) is the dominant influence on climate variability in Fiji. Trade winds are the predominant broad scale winds affecting Fiji and occur in all seasons with varying duration and intensity. 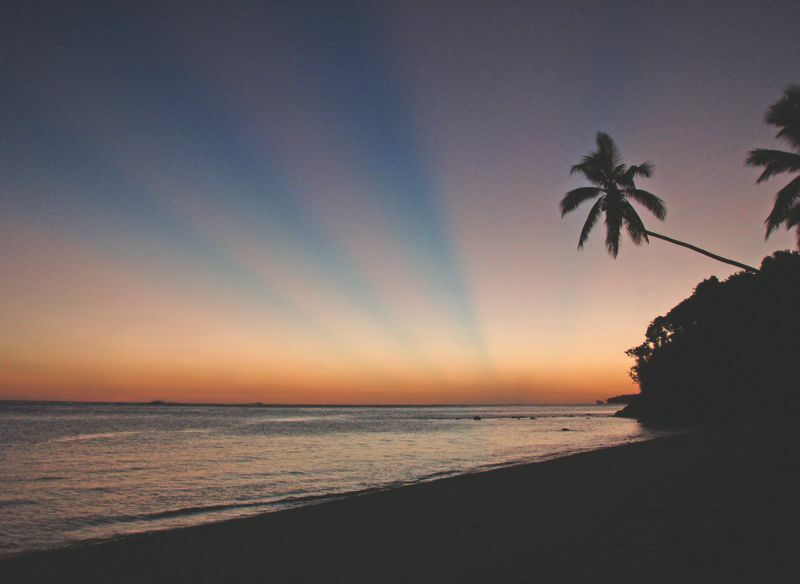 The trade winds blow from the south-east towards the northwest, and as a result there is a strong windward – leeward component to the microclimate of Viti Levu and Vanua Levu, the two largest and most populated islands of Fiji. This in turn affects rainfall to a large extent and temperatures to a lesser extent. On the coast of these two main islands, Viti Levu and Vanua Levu, day-time sea breezes blow with great regularity. The sea breeze strength is affected by the seasons; in summer when daylight hours exceed hours of darkness by 2 to 3 hours sea breezes are stronger than in winter when heating is reduced by fewer hours of daylight. 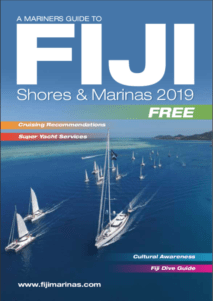 Winds over Fiji are generally light or moderate; strong winds are far less common and are most likely to occur in the period of June to October when the trade winds are most persistent. Tropical cyclones and depressions can cause winds of gale force or stronger from time to time, especially from November to April. See the TROPICAL CYCLONES section below for more information. Temperatures at sea level near the coast around Fiji are fairly uniform. Due to the influence of the surrounding warm tropical ocean waters, changes in the temperature from day to day and season to season are relatively small. The average temperatures change only about 2 to 4 °C between the coolest months (July and August) and the warmest months (January to February). In the lee of the mountains, however, the day-time temperatures often rise 1 to 2 °C above those on the windward sides or on the smaller islands. Also, the humidity on the lee side tends to be somewhat lower. Around the coast, the average night-time temperatures can be as low as 18 °C and the average day-time temperatures can be as high as 32 °C. In the central parts of the main islands, average night-time temperatures can be as low as 12 ºC. South-eastern coastal areas and the high interior often experience persistent cloudy weather, with humidity exceeding 75% during the day for long periods. Monthly average sea surface temperatures range from 26°C to 29 °C. Being located within the tropical latitudes sunshine variations on a seasonal basis are smaller than that of locations at higher latitudes. On June 22nd (Winter Solstice) there is typically eleven hours and two minutes of daylight (excluding twilight) while on the December 21st (Summer Solstice) there is 13 hours and 13 minutes of sunshine. 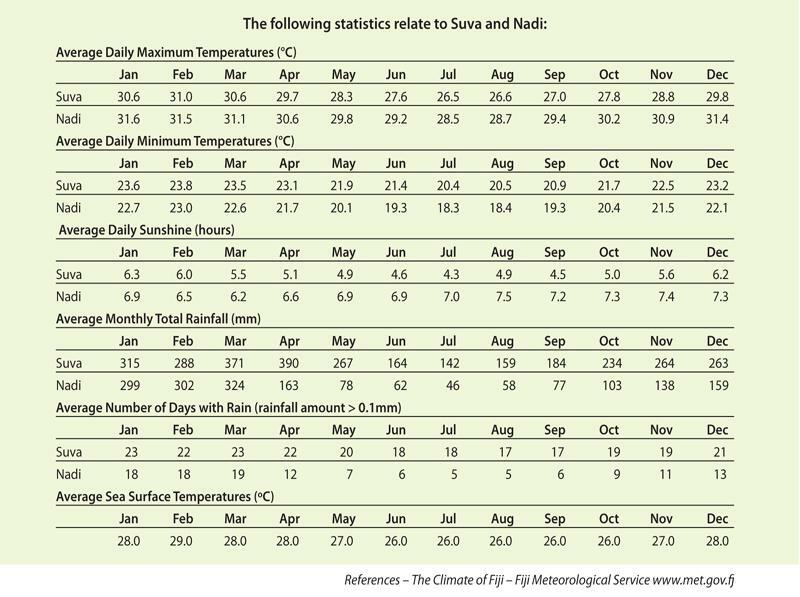 A geographic difference in sunshine distribution is evident between Suva (windward side of Viti Levu) and Nadi (Leeward side of Viti Levu during winter (June to August). The prevalence of onshore trade winds results in significant periods of overcast along the windward coast of the larger islands, often (but not always) associated with showers or drizzle. While these two locations represent the two extremes of sunshine, most locations including all of the smaller outer islands receive sunshine amounts in the mid ranges of those shown in the table attached. “Drē o Malolo” (literally, Malolo is pulling) Malolo is the name of a conspicuous island to the west of Nadi, and this expression means “the sun is setting”, the idea being that, from the point of view of someone in Vitilevu, the sun is declining because Malolo is pulling it down. Rainfall is highly variable and strongly influenced by the orography of the islands and the prevailing south-east trades. The trade winds are often saturated with moisture, causing any high land mass lying in their path to receive much of the precipitation. The mountains of Viti Levu and Vanua Levu create wet climatic zones on their windward sides and dry climatic zones on their leeward sides; hence, the main islands have pronounced dry and wet zones. Little climatic differentiation occurs on the smaller islands. Fiji experiences a distinct wet season (November to April) and a dry season (may to October), controlled largely by the north and south movements of the South Pacific Convergence Zone, the main rainfall producing system for the region. Much of the Fiji’s rain however falls in heavy, brief local showers and thunderstorms. Rainfall is typically abundant during the wet season, especially over the larger islands, and it is often deficient during the rest of the year, particularly in the “dry zone” on the north-western sides of the main islands. Annual rainfall in the dry zones averages around 1500-2000mm, whereas in the wet zones, it ranges from 3000mm around the coast to 6000mm on the mountainous sites. The smaller islands receive various amounts according to their location and size, ranging from around 1500mm to 3500mm. The south-eastern parts of the main islands, generally receive monthly total rainfall of 150mm during the dry season, and 400mm during the wettest months. These parts of the islands have rain on about six out of ten days for the dry season, and about eight out of ten days for the wet season. The north-western parts of these islands are in the rain shadow and receive generally less than 100mm per month during the dry period. The variation in the monthly totals between the two zones during the wet season is little. The wettest month is usually March and the driest month is almost always July. During the wet season, brief heavy afternoon showers and thunderstorms are common in the lee of the main islands. Fiji lies in the area occasionally traversed by tropical cyclones. They are mostly confined to the period November to April, with greatest frequency around January and February. 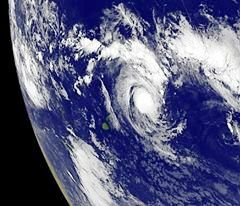 On average, some ten to fifteen cyclones per decade affect some part of Fiji, and two to four will do severe damage. Specific locations may not be directly affected for several years but the dominant north-west to south-east tracks gives some increased risk of damage in the outlying north-west island groups and the north and west coasts of the main islands. Seasonal variability of tropical cyclones also occurs based on the El Nino – Southern Oscillation cycle, with Fiji at higher risk of more and stronger cyclones during warm phase (El Nino years) of the ENSO cycle. Large-scale flooding in Fiji is mostly associated with the passage of a tropical cyclone or tropical depression that results in prolonged heavy rainfall. Urban centres situated near the mouth of the four main rivers on the main island (Nadi, Ba, Sigatoka and Nausori) are affected the most. Localised flash flooding during the wet season (November to April) is quite common. Storm surge and heavy swells can also result in flooding of low-lying coastal areas. Locations vulnerable to storm surge during tropical cyclones include Nadi Bay and Denarau, The Mamanuca and Yasawa islands, northern Vanua Levu including Labasa, and the Ba river delta. The Coral Coast will usually experience one heavy swell event each year causing erosion of beaches, damage to roads and bridges and are hazardous to coastal villages. These events occur most often in winter, when deep lows to the south near New Zealand push swell waves over long distances up on to Fiji. Droughts in Fiji are closely linked to the ENSO (El Niño-Southern Oscillation) phenomenon, which result in below average rainfall for Fiji. A strong ENSO episode is likely to result in a major drought over the country, as happened during 1982/83 and 1997/98 ENSO events. Seasonally dry locations such as the west of Viti Levu during the winter months, where monthly rainfall is 50mm or less, need only experience below average rainfall for a few months to bring about drought conditions.